Windows 10 is pretty darn fast compared to older versions of Windows like Windows Vista and Windows 7, especially on boot up. If you replace your hard drive with an SSD (solid state drive), it’s even more ridiculously fast! But I’m always about optimizing the system to make it even faster! I’ve been using Windows 10 for a while and I’ve run across a few small tweaks here and there that have made my Windows 10 system run blazingly fast. In this article, I’m just going to mention stuff you can do in Windows 10. You can always add memory, get an SSD, or add other hardware performance enhancements, but this post will focus on the software. 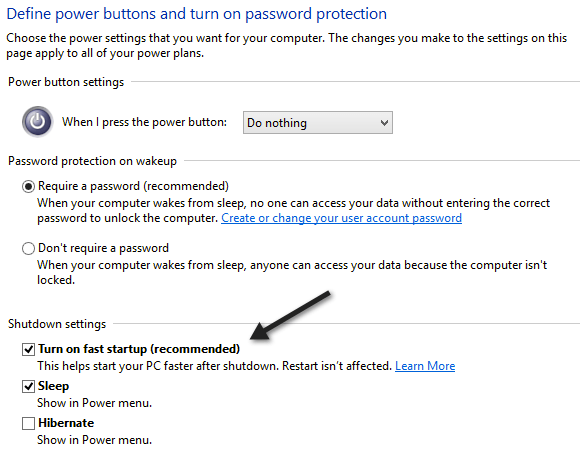 Fast startup is a new feature of Windows 8/10 that helps your computer boot back up really fast from a shutdown. There are a lot of technical aspects behind this feature that I won’t really explain here in detail, but basically Windows doesn’t load everything from scratch on boot up, which makes the boot time a lot shorter. If you don’t have fast startup enabled, you’ll really be slowing down your Windows 10 machine. Check out my previous article on enabling fast startup in Windows 10. 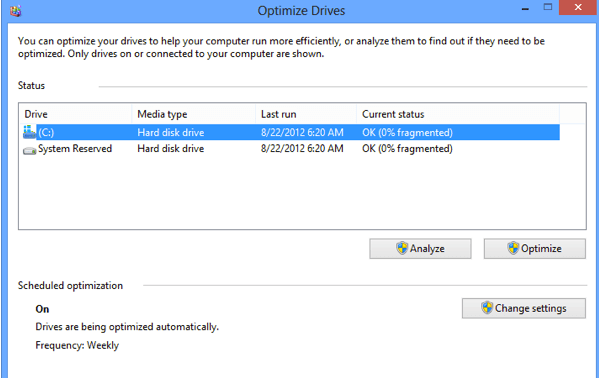 Keep your hard drives optimized using the Optimize Drives feature in Windows 10. It’s basically a replacement for Disk Defragmenter. Make sure that the weekly optimization is turned on for all of your drives. You can read my previous post on how to turn on Optimize Drives in Windows 10. I’ve always found animations, shadows and other small visual effects to be quite useless in Windows. 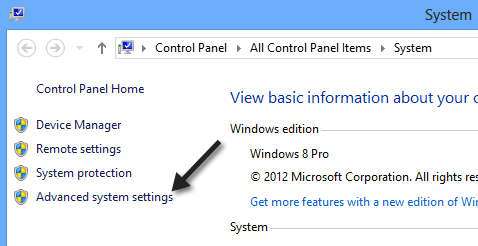 As with previous versions, you can just disable all of those by right-clicking on Computer, choosing Properties and then clicking on Advanced System Settings. In the System Properties dialog, click on the Advanced tab and then click on Settings under Performance. 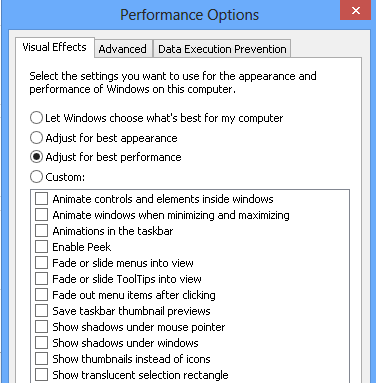 Finally, click on Adjust for best performance, which will basically uncheck all of the animations and effects. As with all versions of Windows, you need to disable all those useless startup items and the same applies for Windows 10. Instead of being in MSCONFIG, you will now find the startup items in Task Manager. Go ahead and disable anything that doesn’t need to start up on Windows login. What’s cool about Windows 10 is that it also gives you a Startup impact score, so you can quickly see which startup items are slowing your system down the most. If you can disable those, do it. The last tip is a combination of several things I do, but they all involve cleaning up the disk. Firstly, you should uninstall any kind of crapware from your computer. 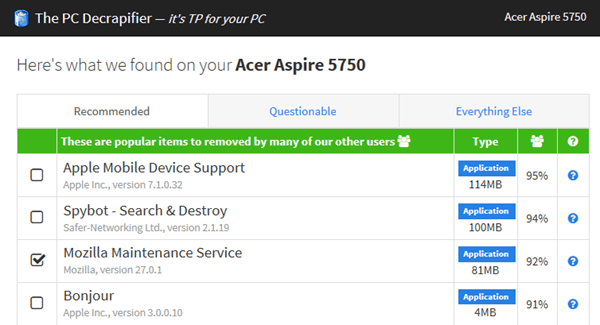 I wrote an entire article on how to remove unwanted software from your Windows PC. The more software you can remove from your PC, the faster it will load. Note that in Windows 10, you also have Windows Store apps, which have to be uninstalled by going to Apps under Settings. 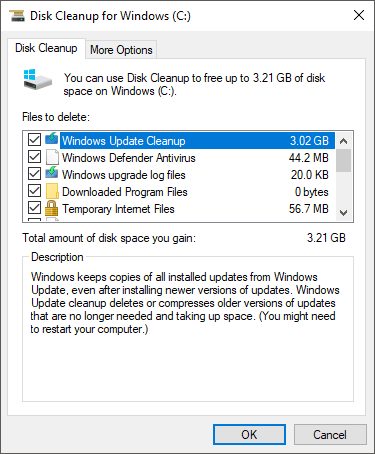 Secondly, you need to run disk cleanup, especially after installing a big feature update in Windows 10. If you upgraded to Windows 10 from an older version of Windows, disk cleanup will save you loads of space by deleting the Windows.old folder. Also, check out my post on other ways to reduce disk space usage. Finally, you need to make sure there are no viruses or malware installed on your system. The best anti-malware software these days is Malwarebytes Anti-Malware. Read my other post on how to properly scan your system for malware and spyware. Hopefully, these five tips will help you enjoy a speedier Windows 10. If you have any suggestions of your own, feel free to post a comment here. Enjoy!